Though I have absolutely no reservations in saying that Immortal has long been a favourite of mine, I’d also have to be honest and say that their place of prominence hasn’t been earned by anything they’ve done in the past 20-odd years. 2009’s reunion album, All Shall Fall, ended up being decidedly tepid at best, while the two albums that preceded it - 2000’s Damned in Black and 2002’s Sons of Northern Darkness - definitely had their share of moments, they also solidified the shift in the band’s sound brought about by Abbath’s transition to primary songwriter after Demonaz’s struggles with tendonitis. 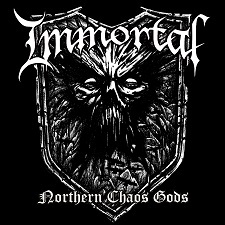 Northern Chaos Gods is a pretty big deal for Immortal for two reasons: firstly, it marks the first Immortal album after the split with Abbath; and secondly, it sees Demonaz returning to guitar and song-writing duties after a very long time away. For long-time fans of Immortal, both of these factors would likely be seen as non-trivial, but the truth is that Abbath’s absence is only really felt negatively in the vocal department, and Demonaz’s return to compositional duties is just what the band needed. Northern Chaos Gods looks backwards far more than it does forwards, with eight tracks that largely play within the margins of 1993’s Pure Holocaust, 1995’s Battles in the North, and 1997’s Blizzard Beasts. Though I’d ordinarily be hyper-critical of a band expending so effort on looking far back into the past for their current inspiration, there are two good reasons why I happily give it a pass here: the first is that those earlier albums also happened to be the ones in which Demonaz contributed as both guitarist and co-songwriter, so there’s a clear continuity at play; while the second, and much more selfish reason, is my steadfast belief that ‘90s Immortal runs rings around ‘00s Immortal, so more of my kind of Immortal is definitely welcome. If you’ve heard the previously released track "Northern Chaos Gods" by this point, then you already have a pretty solid picture of how the remainder of the album sounds, with its frequent compositional and thematic nods to the band’s earlier, heavier days. What you may not be prepared for, however, is just how aggressive the album’s 42 minutes actually are. It’s been a long time since Immortal has gone for the throat like this and I would like to take this opportunity to add my voice to the chorus thanking them for doing so. While Northern Chaos Gods is filled to the brim with thrashy, icy second wave black metal of yore, the album’s production is actually surprisingly and uncharacteristically clean. It’s not so clean that it lacks in personality or sounds overly processed, thankfully, but considering how evocative of the past the material tends to be, the more modern sound here is unexpected but welcome all the same. Though I’ve rather enjoyed the material on offer here, the album isn’t without its issues, and I think the most salient is that it can tend towards being a little too no-frills and unadventurous for its own good. That may sound contradictory considering I’ve praised Immortal for revisiting their older sound, but what I mean is that for the most part the album pretty much plays out like you’d expect it to. I think throwing in a few tasteful lead lines or an unexpected tempo change here or there would’ve gone a long way towards elevating it from being a strong return to form into a truly excellent Immortal album. In the scheme of things, it's not a huge deal, really, because what’s here is a lot of fun, but it's something I'm hoping to hear next time around. Considering I went into Northern Chaos Gods with low expectations, that it turned out as good as it is has taken me by surprise. No, it's not a perfect album, but it’s been a long time since I’ve been interested in what Immortal is up to, and it looks like I am once again.